Requested character(s): Sasha Bordeaux, Danette Reilly / Firebrand II, Anita Fite / Empress, and Mari Jiwe McCabe / Vixen. Rating: Appropriate for most, written for grown-ups. Spoiler warnings: Only for the end of "Bruce Wayne: Fugitive." Author's notes: My use of Checkmate has been culled mostly from the33-issue series and the end of "Bruce Wayne: Fugitive." I'm mostly ignoringthe pertinent GOTHAM KNIGHTS issues. Acknowledgments: Thanks to Domenika Marzione for putting up with myprima donna-ness. There were no mirrors in the Checkmate headquarters, not even in thewomen's washrooms. Sasha Bordeaux wondered idly, as she shook the waterfrom her fingertips, if it was because so many of its operatives were wearingdifferent faces than those with which they were born. She knew from experiencethat catching peripheral glimpses of oneself wearing an unfamiliar facewas somewhat disquieting. Sasha ran her damp fingertips over her unnaturallybrown hair to tame down the flyaways and wiped away what little was lefton the legs of her suit. The walls outside were padded with beige carpeting and lined with mapsand newspaper headlines. Sasha ignored them all as she walked briskly tothe end of the hall and turned left to knock on appropriate door. Sasha entered and stood at attention in front of the desk. Two womenwere behind it. Agent Midnight, Sasha's Bishop, sat in the chair, securein command of her own space. The woman standing behind her was older byat least a decade but her hair was still fiery red. Sasha recognized heras Kalia Campbell, the King's White Bishop. Her demeanor was no less confidentfor playing the intruder. "Roberta," Agent Midnight greeted her. "Thanks for coming." "Bob," Sasha corrected her mildly. She had chosen Roberta for the solepurpose of using 'Bob' as a nickname. "Right." Agent Midnight hadn't been amused. Agent Midnight probablydidn't like the Three Stooges, either. "I assume you know Kalia?" "Good. You've done well in the past six months, Roberta," Agent Midnightcontinued, "and you're ready to move up to Rook, but I don't have an openslot." "There are knights who have been here longer," Sasha pointed out, bemused. "But not knights with your prior qualifications." Midnight leaned backin her chair. "Kalia lost a Rook last week. She has an open slot." Sasha didn't say anything. Rooks were usually drawn from senior knights,field agents on the cusp of retirement, and they were usually drawn fromthe ranks of their own teams. For a Queen's Black Knight to become a King'sWhite Rook was something close to sacrilege. "I have a mission," Kalia Campbell said, walking slowly around to thefront of the desk. Her voice was husky and her body was still trim in itsdark jumpsuit. "It has two components. The first is recruitment." She pickedup a remote from the corner of Midnight's desk and pointed it at the wall.An image appeared, projected by an unseen computer. "This is Cindy Berman,aka Shiv. She battled the Star-Spangled Kid under the tutelage of her father,the Dragon King, and after his death, joined up with the Injustice Society. "The image changed. "Icicle, incarcerated. Johnny Sorrow, presumed destroyed.Black Adam is in Kahndaq. Killer Wasp is incarcerated. The whereaboutsof Artemis Crock and Cindy Berman are unknown." "And you want me to find her? And bring her in?" "Cindy Berman is seventeen years old. She was manipulated, both psychologicallyand genetically, by her own father, to be his weapon." Another gesturechanged the face on the screen to that of a scarred snake. "As you cansee, the Dragon King altered himself to survive for decades beyond whatnature intended. This man," and the image changed again to a small, sneeringface obscured by massive glasses, "is called Dr. Graft. DEO has him incustody and if Miss Berman comes along quietly, we'll be able to reversemost of the damage he's done to her." "You don't expect her to come along quietly?" Kalia Campbell turned off the monitor and set down the remote. "I don't.And that's where the next part of your mission comes in. Let's take a walkto the Dome." "Is the staff standard issue?" Sasha asked, her eyes fixed on the petitefighter in standard black and white Checkmate Knight armor. Campbell hadinformed her in the hallway that the girl was only seventeen -- the sameage as Cindy Berman. "Because I don't think I got one." "She came to us with...certain skills," the White Bishop said, glancingat Midnight. Sasha knew what that meant. Superhero, costumed. Or, she considered, thinking of the ultimate goalof her new assignment, supervillain. "Voluntarily?" Sasha asked. Midnight -- who had never admitted to havinga first name -- hadn't given Sasha herself much choice in the matter, butSasha recognized that she owed her life to Checkmate. She was just morewary these days than in some past. "She was provided with compensation," Kalia Campbell replied coolly.The White Bishop tapped her mouth with her fingers and sighed lightly,surprising Sasha. "She's extraordinarily talented but so very young." Sasha nodded. Campbell had confided on the walk to the Dome that thegirl was currently acting as a pawn but under close watch. Part of Sasha'smission was to evaluate her potential for immediate promotion. "She fights well," Sasha conceded, watching the girl use her staff tolever herself over an enemy drone and neatly dispose of it. She kept herselfprotected on all sides, leaving no openings. "Indeed." Campbell toggled a switch and the simulation ended. A 97%flashed up on the screen. "What do you think?" "When she's at one hundred, she'll be ready," Sasha said mildly. Itwas the same standard to which she had held herself and both the womenbehind her knew it. "Would you like to meet her?" It was a rhetorical question. They hadalready been assigned. Campbell walked down the catwalk stairs and Sasha followed. Midnightbrought up the rear. Her silence was not lost on Sasha -- this was Campbell'sshow. The door of the Dome opened and the Knight stepped out, pulling herhelmet from her head. She was a dark-skinned girl with a topknot. The ponytailwas braided and wrapped around the base. She was very pretty and almostsix inches shorter than Sasha. 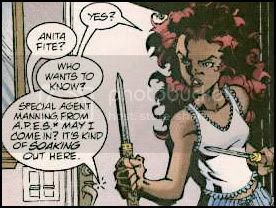 "Bob, this is Anita Fite. She'll be answering to Pawn One on your mission.Anita, this is Roberta Slatington. She'll be acting as Rook and KnightOne." Anita's face lit up and she held out her hand to Sasha. "Pleased tomeet you," she said in a thick New Orleans accent. "Guess we'll be workingtogether?" Sasha smiled reluctantly. "Call me Bob." Blue Valley, Nebraska had been the site of more than its fair shareof action for a town of its size. That action had resulted in a steadysupply of burned-out buildings and at least two teenaged superheroes. Teen superheroes were a topic with which Sasha was not entirely comfortable.She had never met Robin but she'd seen the costume hanging in the Caveand she'd seen the tightening of Bruce's mouth when she'd brought it up.She knew about the Teen Titans, about Stargirl, about the members of YoungJustice who had never been seen again, at least not after the incidentthat had resulted in the deaths of Lilith Jupiter and Donna Troy -- teenagedsuperheroes who had survived their childhoods only to die before thirty. Sasha didn't ask the tiny Pawn-in-Knight's-clothing which one of themshe had been. Sasha had her own suspicions. The girl was well-trained. Sasha had seen her performance in the Domethe day before and watched her perform stretches and calisthenics on thetransport plane. Knights were instructed to remain silent while on assignmentto avoid any manner of identification. Pawn One was taking that to heart,and all the better for it, Sasha thought, considering her accent. Now, Pawn One went straight to the computer and began unloading thecomponents for an auxiliary battery pack from pockets on her belt. Sashaprowled the abandoned lair, observing the patterns of wreckage. She founda room that looked like a cross between a dental office and a smack lab,complete with restraining chair and racks of hypodermic needles. Severalwere broken and various substances stained, congealed on, or corroded thefloor. Sasha stepped around them and inspected the chair. "Knight One!" The call came from the front room and echoed more clearlyin the communicator in Sasha's helmet. The masks tended to muffle verbals. Sasha turned on her heel and strode back into the main hall. "What did you find?" she asked, noting the assembled battery unit onthe floor and the picture on the computer viewing screen. "Not much," Pawn One answered, her fingers flying over the keys. "Butthere's quite a bit of labwork on here. Numbers and spreadsheets. I'm downloadingthem and some clips of surveillance vid. How's this look to you?" She toggleda switch and the frozen picture on the screen blinked out and was replacedby one of the same people in different positions. Sasha recognized theDragon King, his daughter Shiv, Star-Spangled Kid, and the giant robotknown as S.T.R.I.P.E. Checkmate had sent a Knight to acquire the specs on S.T.R.I.P.E. ThatKnight had failed. Sasha had been that Knight -- the only black mark onher service record with Checkmate. She hadn't liked the mission from the beginning. Pat Dugan had a familyand finding her sneaking around his basement was more than enough justificationin her book for self-defense. When she couldn't acquire the plans covertly,she refused further strikes and the Rook running the mission backed herup. On the screen, the Dragon King pointed the hilt of his sword at a manin modified medieval armor. The recording had been damaged and the soundquality was poor. "...hadn't...*crackle*...through time...*static*...savedher...and her friends...*crackle*..."
"... Dragon! Firebrand will...*crackle*...avenged!" The recording froze. Briefly, Sasha wondered who Firebrand had been to inspire so much griefon the man's face. Then, even more briefly, she wondered what expressionhad been on Bruce's face when he'd learned of her alleged death. "Do we know who he is?" Sasha asked instead, nodding at the tragic visage. "Shining Knight," Pawn One replied. "Sir Justin of Arthur's roundtable.Frozen in ice for centuries, member of the Seven Soldiers of Victory --the group that got time-shot, and there's nothing else in the files pastthe JLA bringing them all back." Sasha nodded. "What about this Firebrand he mentioned?" "Member of the All-Star Squadron," Pawn One said after pulling up thedata file. "Died fighting the Dragon King." She looked up at Sasha andshrugged. "If that's the right one. There were a couple of them." "Fine," Sasha said dismissively. Firebrand wasn't part of her mission. "Any word on Shiv?" "Data sets," Pawn One replied. "Looks like her dad was using her toexperiment on. Genetic enhancements. Speed, strength, flexibility...theusual ball of wax. And...maybe some other things. It's hard to tell fromthe data. Lots of numbers, not many notes." Her voice sounded tight. Sasha gauged her tone carefully. Pawn One was the daughter of retiredAll Purpose Enforcement Squad agent Donald Fite. Reports were that sheand her father were close and she had demonstrated no metahuman abilities.Her skill levels were within range for a normal human female of her age,extensively trained in a handful of areas. "Bring the data," Sasha said. She looked around at the debris and dustlittering the room. "She won't be coming back here." Sasha sat in the cockpit of the small transport plane, surveying thedata collected in Blue Valley. The experiment data showed that Shiv's enhancementswere not limited to intrinsics, but also included mutating her existinglimbs into weaponry. It was nauseating to read and Sasha was beginningto doubt that even Checkmate could recondition this girl after the damageshe'd endured. She tapped the console as she pondered, hearing the quiet thumps ofPawn One performing her evening workout in the living section of the transport.Finally, she reached out and opened the Personal Data Administration Network,or the P-DAN program and typed in the password Kalia Campbell had givenher. It allowed her Rook-level access and would expire in a week. She intendedto take full advantage of her new allowances. "Firebrand," she murmured as she typed in the name. Three names cameup on the screen. She clicked on each in turn and checked the dates each had been active.It was fairly clear to her that Shining Knight had been referring to theonly female of the group, Firebrand II, Danette Reilly. Sister of FirebrandI, lover to Shining Knight -- Sir Justin, Sasha noted with some amusement-- and adoptive mother to Teri Rothstein, nee Kurtzenburg, before her deathby the Dragon King in 1960. Reports stated that she had led a team againstthe Dragon King in his lair. All the bodies were found except her own. Sasha's mental red flags went up. No one had buried Sasha Bordeaux'sbody and for good reason. She wondered if Bruce had asked to see the body.She wondered if that was why he'd attacked Checkmate so confident in hersurvival. She shook her head and logged out of P-DAN. Her research forthe night was finished. The Dragon King had had a lair in Ivytown beforeBlue Valley and she had already set the transport controls to take themthere. The cockpit seats were deep and comfortable and the plane was on autopilot.Checkmate's version of autopilot allowed the plane to not only fly itselfto a specific destination but circle a specified area upon arrival. Theplane could land itself, but would not until the correct authorizationcode was given. It had been a long time since Sasha had really allowed herself to thinkof Bruce. She'd walked away from him in Robinson Park and she did not regretthat. There was no place for her in his life. Even his desperate, romanticgestures had seemed awkward, the movements of a man who knew what he neededto do but was so far detached from his feelings, that they were academicat best and foreign intruders at worst. It didn't stop her from loving him. She wasn't *in* love with him, notanymore, not after months without seeing him, speaking to him, hearing*of* him. The memory of his mouth on hers in the cold park had faded tobrief flashes of a fever dream, but his hand still burned her shoulder.He had risked much to comfort her and sometimes, when she closed her eyes,she could still feel the warm weight of that one touch. The lair in Ivytown was nearly a duplicate of the one they'd visitedin Blue Valley. The damage patterns were different and the computers lessadvanced, but the similarities were enough to give Sasha a definite senseof déjà vu as she walked into the vast room. "You can't tell me she's hiding out here," she murmured directly intoher comm device. Pawn One shook her head. "Not my first choice of places," she agreed,sotto voce, and crossed to the computers, unsnapping the pouches on herbelt. Sasha wasn't even sure why the Ivytown lair was still in existence.Standard procedure was for DEO to comb the place for data and any usefultechnology, sanitize it, and bulldoze it. Underground lairs were usuallydestroyed by dynamite and filled in with cement or dirt, she recalled.Maybe DEO was behind. They weren't particularly known for their efficiency,though Sasha had heard that Cameron Chase was good people, and there certainlywasn't a shortage of evil plans interrupted by costumed do-gooders. Sashamight have helped in the destruction of one or two herself. She had anotherflash of Bruce, and tamped it down before it became an actual memory. She wouldn't be one to wallow. As she toured the facility, she began to catalogue the slight differencesbetween this lair and the one they'd left late last evening. She had yetto find the entire generator system and that bothered her. The Dragon Kinghad needed a lot of power for his mind-control satellite and even thoughhe'd been nowhere near the level of readiness he had been when the Star-SpangledKid had destroyed his headquarters, Dr. Graft's experiments would haverequired a massive power supply. "Any luck with the files?" she asked into her comm unit. "Not a thing," Pawn One replied from the outer room. "Where are you?" "Looking for what ran this place," Sasha replied. "I don't see a singlegenerator down here." "I think the DEO wiped the comps," Pawn One said. "There's a whole lottanothing on here and I can't patch into the security cams. You see any stillup there?" Sasha looked up at the corners of the hallway. "They're still here,"she reported. She walked around a corner and found a metal door, boltedshut. "I've got a locked door down here. Do you have a release?" Sasha waited patiently and was pleased to hear the lock pop. "It did, thanks." Sasha pushed on the door and nudged a piece of burntand twisted metal under the edge to jam it open. Satisfied that she wouldn'tbe locked in the room, she stepped inside and surveyed the gruesome contents.There were no bodies or blood, but the machine against the back wall wasdefinitely intended for human use. Metal bands for the wrist and ankleswere twisted and broken, and small pads at hand-level were charred black.A large panel perpendicular to the machine housed burnt-out controls andpower containment boxes rest dark and dead in the corners. A desk oppositethe machine was scorched across the front but relatively undamaged. Sashayanked on the lowest drawer and found it locked. Checkmate Knight's kitscame with equipment designed for breaking and entering so it was only amatter of time before Sasha was able to get inside. Laboratory notes, reams of them. Dates that sprawled decades, powerlevel readings that were measured every eight hours. Human vitals -- temperature,heartbeat, respiration. Initials in the upper left-hand corner of eachcover page -- DR. Sasha stacked them on the desk and searched the restof the desk. The upper drawer held the skeletons of two rats and half aTwinkie. She shuddered to wonder what had caused that tableau. She shutthe door and approached the torture machine. It had wires and leads, butthe power direction seemed, to her untrained eye, to be out, as in draining,rather than in, as in electrocution. Had someone been in here? Had -- andshe hesitated to think it, because there was not enough corroborating evidence-- Danette Reilly been held here? She twisted off a piece of metal that had served as a wrist restraintand saw dark stains inside. A small sterile knife flaked enough of thestain into a collection bag for Sasha to be confident it was blood. Sashawas very familiar with the smell and appearance of dried blood, even driedblood as old as this. She sealed the bag and collected the pile of data before kicking themetal strip away from the door and letting it close behind her. "Pack up, Pawn One," she said, trying vainly to disguise the tirednessand disgust in her own voice. "It's time to blow this joint." Back on the transport, Pawn One watched Sasha shake the flaked bloodonto a specially prepared slide and slide it into the DNA analyzer. "Isn't that just going to tell you that it's Danette Reilly's blood? "she asked, peering over Sasha's shoulder. "It's going to give up the gene sequence which we can compare to whateverDNA samples Checkmate has on record," Sasha said. "And they've got a few." The stacks of data had eventually revealed that Danette Reilly, akaFirebrand, was indeed the subject of the human data and that Dragon Kinghad collected the energy her powers produced and converted it to electricity. "This is going to take a while," Sasha told her. "I've got some researchto do if you want to go do something else." Pawn One shook her head. "I've just been trying to figure out whereShiv would go," she said. "Tigress is still out, yeah? Maybe they're together?" "That's good thinking," Sasha agreed, making a few keystrokes on thecomputer. "But we've had a Pawn on Artemis Crock for the past week andwe've found no evidence they're in contact. Crock's been spotted in a coupleof robberies in the past six months. No sign of Shiv. She's down lickingher wounds somewhere, if she's even still alive." "No mother?" Pawn One asked. "No other woman she might trust?" Sasha frowned. Of course a teenage girl would gravitate toward a womanshe could trust. But who would Cindy Berman trust. "Wait a minute," she said, spinning in her seat. She called up the dataon the Ivytown lair and clicked on the link to the history. The informationregarding who destroyed the place was Rook-encrypted and she mistyped thepassword once before getting in. 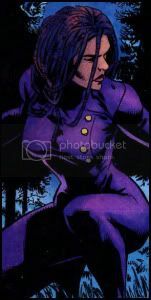 She accessed the roster for that mission and was pleased to find a femalename. Mari Jiwe Macabe, Vixen, had been with the team at the time. Shenodded to herself glanced back at Pawn One. "It might be a dead end," she warned, "but it's one worth checking out.Good job, Paw -- " She caught herself and smiled at the girl sitting nextto her. "Good job, Anita." Mari Macabe was taller than Sasha and had legs to die for. Sasha was above hating her instantly, but not by much. "Hi," she said, stepping around the table and sitting across from Mari.The tiny café in Sao Paulo had few customers early on a Monday morningand there was no one within earshot. Still, she activated the white noisedevice on her wristwatch and was pettily pleased to see Vixen's nose wrinkleat the sound. "You are Roberta Slatington?" Vixen's voice was lovely, as well, deepand rich with a lilting accent, and obviously distrustful. "Call me Bob," Sasha instructed with a grin. "And you represent Checkmate." Vixen raised one elegantly arched eyebrow. "Have they given up on uniforms since I left?" "I'm showing my face as a courtesy," Sasha said, somewhat annoyed thatVixen would question her professionalism. "In a past life, we shared afriend. He had pointy ears and lots of dough." Vixen smiled suddenly, and the wariness on her face disappeared briefly. "And how is our old friend?" she asked eagerly. "He's out of jail, at least," Sasha said, before she thought. "There's that," Vixen agreed. "I hope he's remembering to eat." It was the weirdest comment Mari Macabe could have made right then andSasha decided it was time to change the subject. "Vixen, I'm under orders from Checkmate to locate and recruit CindyBerman. We have custody of Dr. Graft and we can reverse the procedureshe performed on her if she comes with us." "At what price?" Vixen asked, heat edging into her voice. She didn'teven challenge Sasha's assumption that Shiv was with her. Either she hadspotted their surveillance or she didn't care. "She becomes a pawn? Youknow 'Pawn' isn't just a title in that agency, Bob. Everyone's a pawn.The Pawns, the Knights, even the Rooks are manipulated into carrying outthe King and Queen's bidding." "Amanda Waller is no longer the Queen of Checkmate," Sasha remindedher. "Do you even know who the Queen is now?" Vixen asked, her accent deepeningwith her intensity. "Do you know what goals Checkmate holds? Do you knowwhat you'll be asked to do next week, next month, next year?" Sasha realized she was holding her breath. She exhaled carefully, holdinga poker face. "Do you?" "No." Vixen sat back and shook her head. "And I don't want to. I'm out." "That's your choice. But let Cindy make her own choice." "Have you seen what they did to her?" Vixen's eyes were sad. "Dr. Graftand her father?" Sasha shook her head. "I haven't seen. I've seen the lab reports, butI haven't seen the results. But we're offering her a way to be cured --"
"Are you? Or are you offering her body for her soul? Would you cureher if she declined to enter into a contract with your organization?" Sasha wasn't authorized to make that decision, but she spoke anyway. "We would. But we couldn't allow her to return to her life of crime." Vixen shook her head. Her eyes glinted dangerously. "Leave her alone,Miss Slatington. She's been through enough." "At least let me talk to her." "Isn't your young assistant having that discussion as we speak?" Vixen had out-maneuvered her and Sasha was reminded that the other womanhad once been in her place. "Very well," she said, inclining her head. "But give me your word thatif Cindy does decide to accompany us, you won't stop her." Vixen studied her. The hostility was nearly tangible. It might havebeen disconcerting to someone else but Sasha had been studied by Batmanand Vixen's stare was mild in comparison. "Do you approve of teenagers putting their lives on the line?" she asked. "Teenagers die for their ideals every day of the week," Sasha said evenly,thinking of the suicide bomber who had taken her parents' lives, and ofthe Robin suit in the Batcave. The images were painfully at odds, remindingher that teenage superheroes were maybe not so different than the restof the world. "I don't approve of giving them a vehicle to do so, but ultimatelyI have very little say in the matter." She felt the shift of philosophyinside and it settled in a very uncomfortable way. "Well, then," Vixen said quietly. "May God have mercy on their souls." As expected, Pawn One -- Anita -- returned to the transport alone. "I told her we'd be here until midnight if she changed her mind," shesaid briefly. Sasha nodded and settled in at the cockpit. Anita had taken initiativein making the decision to wait and Sasha was pleased. She didn't thinkShiv would appear but giving her the option to change her mind was smart. The DNA analysis was waiting for her when she logged in and she openedthe message fully expecting the blood to belong to Danette Reilly. She spent the rest of the evening doing research and at half an hourbefore midnight, walked outside to find Anita sitting on the ladder atthe hatch. "If she comes," Sasha said, her voice clear in the still night, "itwon't be until the last minute." "You think?" Anita asked. She held her staff loosely in both hands,rolling it as she waited. "That's the way it usually happens," Sasha told her. She walked overand leaned against the wing. "What happened when you talked to her?" Anita shrugged. "She said no and that she'd never let Dr. Graft havea chance to do one more thing to her." "And then she said that she liked what she was and that she'd...evolved,or something, and had no reason to change. I think she was just scared." "Maybe," Sasha agreed. "Look." She leaned back and ruffled her hair. "If I don't recommend your promotion to Knight, I want you to know thatit's not for lack of skills in the field. I'm impressed with your workon this mission. But you're young and you're capable and I think you shouldhave as much experience as possible before taking on solo missions." Disappointment flickered across Anita's face, but her nod was calm. "Always something more to learn?" she noted with a smile that wasn't completelyforced. "Always," Sasha confirmed. She looked at her watch. 12:12. "Are we going to make her come with us?" Anita asked. Sasha hated that the question was perfectly logical. "No," she said. "We're going home alone." Roberta Slatington, the Queen's Black Knight, shook water off her fingertipsand smoothed her hands over her unnaturally brown hair to tame down theflyaways. She knew better than to look for a mirror in which to check herreflection. Today, she was glad she didn't have one. She walked briskly to the other end of the hall and knocked on the right-handdoor. Sasha did, standing at attention in front of the desk. Kalia Campbellleaned back in her chair and studied her. "The subject declined our offer," Sasha said succinctly. "Very well. Is that all?" "That is all as relevant to the mission," Sasha said. The White Bishop nodded, standing and walking around her desk. She leanedagainst it, crossing her arms and ankles and gazed as Sasha. "At ease, Knight. Speak frankly." "I ran a DNA analysis on a sample of what should have been Danette Reilly'sblood. Instead the computer told me it was yours." Kalia Campbell nodded slowly. "It's been a long time since I heard thatname. You're far from the first woman to die and get a new face from thisagency." "Dragon King was using you as a power generator for his entire complex." "Forty years," the White Bishop confirmed, her face serene. "He keptmy body in stasis so I'm still spry enough to jog around the block, butI'm afraid that's about it." She held one finger over a holiday-scentedcandle sitting on her desk and Sasha saw a tiny spark fizzle and crackleas the wick caught flame. "Parlor tricks, these days," Kalia said regretfully. "Cindy was twelve when the Suicide Squad stormed the compound. She letme out of stasis because she thought I'd help her father. I used my powersto destroy the restraints and the power supply and that was all I had left.I woke up in a Checkmate hospital." She chuckled. "We should really starta support group for that." "I didn't turn this in with the rest of the evidence," Sasha confessed,holding out a data chip. She wasn't sure what impulse had caused her tohold the scene back, but she suspected it was a last romantic notion towardBruce. Among hundreds of boring and nonsense bits recorded by the securitycameras was an image of Shining Knight learning of Firebrand's death. Sashahad felt it too personal to be stored in the evidence vault. It was purefancy on her part, but the look on Sir Justin's face was identical to theone she imagined on Bruce's face when he learned of her death. Kalia Campbell took the chip and regarded it solemnly. She seemed tohave an idea what was on it. "He had been missing for a dozen years by the time I led the chargeagainst the Dragon King," she said quietly. "When I took a new face, Inever dreamed he'd be back." "Is it too late now?" Sasha asked without thinking. "I'm Kalia Campbell," the White Bishop said firmly. "Danette Reillydied a long time ago. And now she's been avenged." Sasha nodded. "Thank you, ma'am." She came to attention took Campbell'snod as a dismissal. She had her hand on the door handle before she rememberedone last question. "Oh, go ahead," Kalia said with a smile. "You've figured out everythingelse." Sasha's mind reeled with the implications. "Ma'am." "You've passed the last test, Bob. Are you coming over to be one ofmy Rooks? Or does that witch Midnight get to keep you?" "Only if I get Fite as a Knight," Sasha countered. "All right, then." Kalia nodded. "Not a word of this, of course." "Very well. I'll see you on Monday, Bob. I've got a mission lined up." "Looking forward to it, ma'am." Sasha saluted smartly and left Campbell'soffice. She went straight back to the women's restroom and lost her lunch inone of the stalls. There was such a thing as too much knowledge and shekept her eyes on the basin as she rinsed out her mouth. Sasha Bordeax hadno choice but to be reborn in Checkmate as Bob Slatington. Danette Reillychose to end her life in hope of something even a little bit better. Now she knew why the Checkmate headquarters had no mirrors. Reference images from DETECTIVE COMICS #763, YOUNG JUSTICE #47, andMANHUNTER #5. Origin of reference image for Firebrand II is unknown.